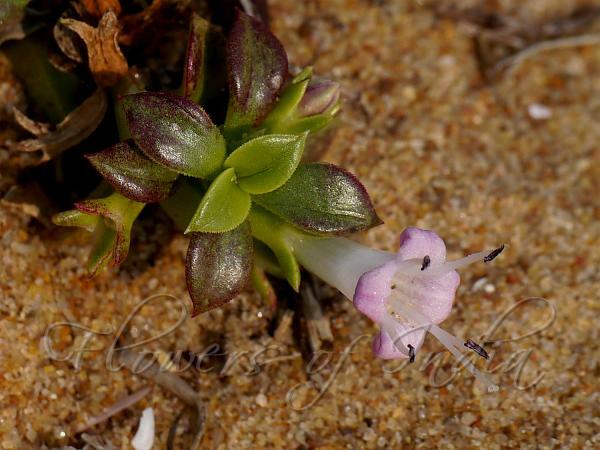 East-Indian Water-Bluet is a succulent prostrate creeping herb with stems, mostly covered by sand, up to several meters long. Rising up flowering shoots often not more than 10 cm long. Leaves are nearly stalkless, blades narrowly elliptic-oblong or spoon-shaped 1.0-2.5 cm long, 5-8 mm broad, tip pointed, hairless. Flowers are white, tube 6-7 mm long, petals triangular, 3-4 mm long, borne singly or in pairs. Sepals are ovate, about 1-2 mm long, stamen filaments slender, 3-4 mm, anthers oblong, 1.5 mm; style plus stigma about 8 mm long. Mature fruit is about 4-5 mm long. In adaptation to its sea-side habitat and to fruit dispersal by sea currents, the genus has developed fruits with thick and corky walls which no longer split open. 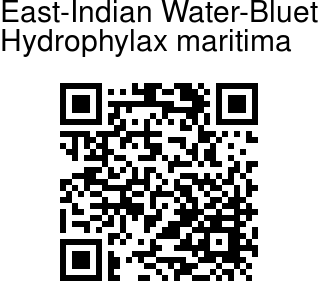 East-Indian Water-Bluet is found on sandy beaches and usually growing in large colonies in S. India, Sri Lanka, Andaman Islands, at sea level. Identification credit: Dinesh Valke Photographed in Chilika islands, Odisha.